History was made in Enugu State, yesterday, as Governor Ifeanyi Ugwuanyi inaugurated one of the five new Ultra Modern Fire Service stations being constructed by his administration across the three Senatorial Districts after 56 years such projects were built in the state. It would be recalled that the last time three fire service stations located at Ogui, Enugu North Local Government Area, Nsukka, Nsukka LGA and Idaw River, Enugu South L.G.A were built was in 1962 when Enugu State was under the defunct Eastern Region. This came as the governor made a further passionate appeal to the federal government to reimburse the state government the money spent on the reconstruction and rehabilitation of some federal roads in the state. Receiving the Honourable Minister of Power, Works and Housing, Babatunde Raji Fashola at the Government House, Enugu, when the latter paid a courtesy visit, Gov. Ugwuanyi explained that based on the report from the committee set up by the Minister to assess the true value of works executed by the state government on federal roads in 2009 and after 2009, the total certified amount stands at N22.8 billion. The governor further explained that the state government’s interventions between 2015 and 2018, which are yet to be certified by the Federal Ministry, have been assessed at N13.015 billion. He stated that the “humble and passionate appeal to the Federal Government for the refund”, not only “accords with best practices and fairness but will significantly boost our capacity to tackle some of the state’s pressing challenges especially in the face of the severe economic circumstances confronting the nation today”. The Minister, who informed the governor that he was in the state on inspection tour of the on-going federal government’s development projects in the South East geo-political zone to ensure that they are delivered on time and according to specifications, stressed that “irrespective of political structures, development is the ultimate”. Speaking at the inauguration of the Fire Service station at Ogrute, Igbo Eze North L.G.A, the state’s Chief Fire Officer, Engr. Okwudiri Ohaa thanked Gov. 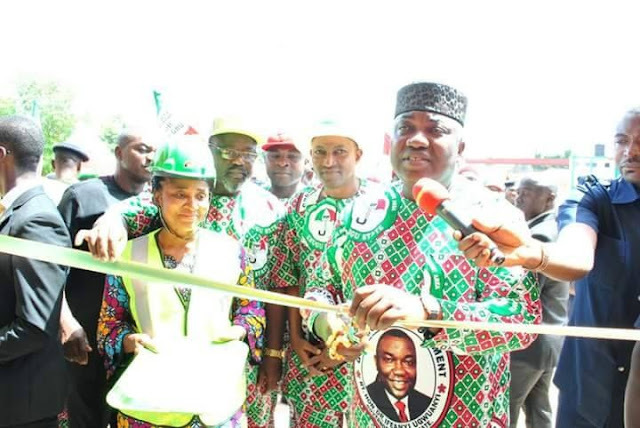 Ugwuanyi for his “total commitment towards safety in the state by constructing 5 new ultra modern fire stations across the state bearing in mind the last time a fire station was built in the state was in 1962, in the now defunct Eastern Region, which is over 56 years”. “I equally praise the quality of work done, which is of international standard. I pray God to continue to strengthen His Excellency to continue the good work he is doing in Enugu State and bless him (Ugwuanyi) in a special way for remembering the abandoned Enugu State Fire Service”. Other four stations, nearing completion, are strategically located in Four-Corner, Ozalla, Nkanu West LGA; 9th Mile Corner, Udi LGA; Orba, Udenu LGA and Oji, Oji River LGA.